Peterborough Panthers now treaat home meetings with the same sort of trepidation usually reserved for a visit from the mother-in-law. Gone are the days where the city racers were the kings of their own castle, regularly blowing away all-comers by monster winning margins. Right now they would be grateful for any sort of success at the East of England Showground. Therefore, in a season which has already seen six home defeats in all competitions, a disappointing 45-45 deadlock against next-to-bottom Redcar last night (August 29) should not be dismissed as a complete disaster for a Panthers side containing two outgoing and two incoming riders. Even though there weren’t many half-full glasses at Alwalton, or on the city club’s various social media channels, this could prove to be the valuable point which does earn qualification for the play-offs rather than a couple that they could ill-afford to drop. The two teams remained deadlocked through the final four races of a tension-packed contest after Redcar had clawed themselves level courtesy of a 5-1 from skipper David Bellego (a very fast Frenchman) and Jye Etheridge (a rookie Australian) in heat 11. Nikolaj Busk Jakobsen, one of two men on show for Panthers for the final time, was on the receiving end of that Bears maximum as he marked his exit with a performance that summed up why he has been sacrificed. One smart ride and three that were mediocre at best added up to half-a-dozen points. Fellow departing rider Ashley Morris was a prominent figure early on before his final appearance in Panthers’ colours when downhill due to bike trouble. Rising into the main body of the team, Morris led home number one Craig Cook for a 5-1 to set the ball rolling. That was the personal highlight though, as he was later plagued by mechanical gremlins. Morris retired from his second outing, failed to make it to the tapes within the necessary two minutes for his third ride and then had to nurse a poorly machine home to take the point on offer for third place in a heat 10 re-run. And that perfectly summed up the plucky attitude Morris has shown throughout his seven-week stay at Peterborough. Few would be disappointed to see him back in the future. But what was immediately clear last night is that the first two of four arrivals did little to perk up an under-performing Panthers team. 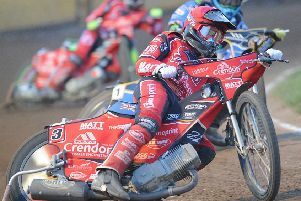 Anders Thomsen was paid for 11 points as he began his latest end-of-season stint with the club by earning selection for the big winner-takes-all (or both-sides-settle-for-a- draw) finale, but new mandatory British rider Danny Halsey could manage only one point. In fact Halsey’s smartest piece of work was quickly picking himself up from a high-speed slide-off in a re-run eighth heat, gathering up his bike that had bounced 20 metres further along the track and dragging it clear to allow the race to continue. Halsey had no doubt seen partner Zdenek Holub out in front and the Czech reserve’s eight-point haul was a welcome positive given a potentially weak bottom-end of the Panthers team will still be relied upon for points following the arrival of prestige signing Kenneth Bjerre this coming weekend. Holub and Halsey looked set to claim a 5-1 in heat two only for the impressive Etheridge to split the pair, but that 4-2 still had Panthers six points to the good after just two races. Racing was then held up due to work to repair ruts on the inside of turn two and the delay (the second of the night after a low sun kept fans waiting for the meeting to start) clearly allowed Redcar to regroup as they responded with back-to-back 5-1s to wipe out their arrears and ease two points clear. It was a short-lived advantage as up-and-down Panthers captain Ulrich Ostergaard and Thomsen bounced back from conceding one of those maximums by delivering one of their own in heat five. Panthers held the subsequent two-point lead until Cook’s success and Morris’ untroubled limp round for third spot earned a 4-2 in the re-run of heat 10 after Redcar man Jonas B. Andersen had flown off the back of his bike when leading the initial staging. But the hosts saw their lead wiped out immediately after the interval by that Bellego-inspired 5-1 and the Redcar proved to be a key man in the remainder of the contest. He also ended the unbeaten record of rival number one Cook when adding a heat 13 victory to his collection before completing a hat-trick with success over Cook and Thomsen when the finale went ahead after another stoppage to allow for parts of the air fence to be re-inflated. Unfortunately, Panthers’ quest for the play-offs appears to have been blighted by a slow puncture after winning just one of their last seven league meetings. But, on the bright side, the point gained did lift them up to fifth place in the Premier League standings and increased their buffer over an Ipswich side, who sit immediately below the play-off zone, to five points. Panthers are back in action on Sunday (September 4) when staging a 30-heat feast of racing with back-to-back home meetings against Rye House (2.30pm) and Workington (5pm). And they will have the fastest Peterborough rider in history, Bjerre, in their side along with 2006 Elite League title-winner Richard Hall for those clashes. PANTHERS: Craig Cook 12+1, Anders Thomsen 8+3, Zdenek Holub 8, Nikolaj Busk Jakobsen 6+1, Ulrich Ostergaard 6, Ashley Morris 4, Danny Halsey 1. REDCAR: David Bellego 11, Jonas B. Andersen 8, Jye Etheridge 7+4, Hugh Skidmore 7+2, Lasse Bjerre 7, Lee Payne 3+2, Tobias Busch 2.